It’s difficult to strike the right tone between professional and personable in B2B email marketing. 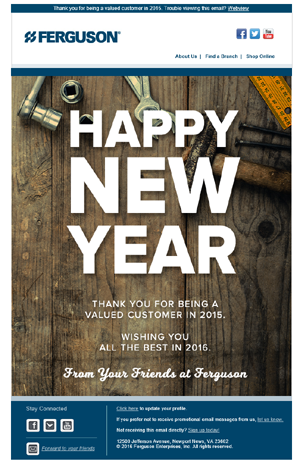 When Ferguson marketers wanted to find that balance, they used it to create valuable, memorable holiday email sends. Read how the team was able to see a 34% effective rate for a ‘Year in Review’ send as part of creating personalized, creative email marketing. Ferguson primarily serves professional contractors, according to Mary Abrahamson, Email Marketing Manager, but many homeowners also know the company for Ferguson Bath, Kitchen & Lighting Galleries. “Since we serve mostly professional contractors, typically the homeowners we work with are ones that are paired up with a builder, designer or an architect, and that's the way that they come into our showroom,” she said. But over the last few years, Ferguson has seen more walk-in traffic in its Ferguson Bath, Kitchen & Lighting Galleries. A continued focus on the value of the showroom experience has helped the company serve those customers. The largest wholesale distributor of plumbing in the US, as well as a top distributor in other segments like HVAC, waterworks and industrial, Abrahamson said the company has grown to almost a 14-billion-dollar company with more than 1,400 locations and 23,000 associates nationwide. “Our core differentiators are world-class service and treating employees like family,” she said. With its product offering, Ferguson spans a number of different customer groups, such as waterworks, plumbing, heating and cooling, facility supply, among others. With such a wide swath of customers, speaking to those groups individually and with personalized messaging is vital. “Our email marketing program acts as a support system to all of our different business groups in targeting almost 100% [of] existing customers and cultivating those long-term relationships,” Abrahamson said. A good tenant of any long-term relationship is spending the holidays together, an idea Ferguson decided to integrate into its email marketing. However, on certain holidays, it can be near impossible to stand out. She and her team decided to take the opportunity to think outside of traditional holidays — while still participating in them — but focusing instead on developing holidays that might appeal exclusively to their customers. This workaround for the holiday email send meant that instead of competing against hundreds of others, Ferguson was going to stand out by transforming a random Monday, for example, into National Bathtub Day. “We hand pick which [holidays] make the most sense for social, which ones make sense for email, landing page, digital signage,” she said. The difficulty, Abrahamson said, can be in balancing the spirit of an attention-grabbing email with the company’s overall brand voice. “Most B2C companies, they can be cheeky. They can be funny. They can send that silly email. In our space, we can have a little fun sometimes, but we definitely have to make sure that it relates directly back to their business,” she said. In 2016, however, the team tried to plan for the year with each type of business they work with in mind. Each of the email specialists works with a particular channel’s marketing manager, she said, and the idea this year was to put together a list of what holidays would make sense and deciding if they had robust content to go alongside it. “Getting customers to engage with your message, regardless of whether or not they convert at that moment, is important for not only your long-term email program goals, but it can help foster a favorable brand experience and extend the lifetime value of the customer as a whole,” she said. Abrahamson and her team have a monthly meeting with marketing managers, and one was dedicated to deciding what holidays channels to take part in. “It was really just everybody throwing out ideas and basically putting up their hands to say, ‘Yes, this makes sense for my channel or this doesn't,’” she said. The quality content is what shows respect for the industry, while also having a bit of fun by focusing on the holiday. “The WATERQUIRKS: Independence Day Edition gives the history and the background of their trade, their business. So, it's fun. It's interesting. But it's actually information that [customers] care about,” Abrahamson said. This email, as well as a few others, encouraged people to “Forward to a Friend,” which about 10% of people clicked through on and also had a pre-populated tweet button. Another version was sent to customers who were registered online, where Ferguson would make the call-to-action a “Shop” ask. Another example of this content-rich style, which had a sharing CTA, came in a “Respect for our Industry” send to the plumbing sector, which was influenced by the holiday emails. Also, because it mentioned the first time cast iron piping became available, the team added a link to shop cast iron soil pipes. “Even when the email itself really doesn't have a lot of call-to-actions, you still have people clicking in our [navigation.] Getting our customers good content in their inbox results in some return from that shop link up top,” she said, adding that in the WATERQUIRKS email, 14% clicked through to shop out of the navigation. In general, the goal for these emails is customer engagement, “so things we can measure — clickthroughs, time on site,” she said, adding in self-service events, which would be ecommerce activity like paying a bill, checking a price or adding products to a favorites list, also known as My Lists. The team is, of course, hoping for conversions on these sends, but it’s important to understand what the best goal is for each send. That affects the call-to-action in the email. “For [sends] like Black Friday, another big conversion is online registrations. We push people to register for our ecommerce site in order for them to even see the deals,” she said. Abrahamson and her team have repurposed some of the same holidays they have done in the past, including Earth Day, News Year’s and Black Friday. The real change, she said, is not just all of the pre-planning, but including all teams in the process. “Everybody is always striving for content, and it simply doesn't need to be recreated every single time, especially when you're talking about holidays; they happen every year,” she said. Social media marketing, web content, merchandising, strategic products and the business group working in tandem on implementation, as opposed to working in a silo, also ensures that content is cohesive across different channels. “You can't market [campaigns] as separate entities. They have to work together ensuring items you are promoting or the content you're promoting is available in all sales channels,” she said. A good example, she said, of how this collaborative pre-planning has helped to evolve the holiday email campaigns is found in the New Year’s email. Typically, in the past, she said, it has been a simple, “Happy New Year. Thank you for being a valued customer. Wishing you all the best.” In the years following, they’re able to repurpose that for different customer groups, only changing the branding. This cross-collaboration ensures that great content is not only created for email, but once it’s sent, it doesn’t just stop with that channel. Abrahamson attended MarketingSherpa Summit 2016 (returning after presenting Ferguson’s B2B Best-in-Show winning campaign at the 2014 event) and came back to her team having been inspired by the presentation on email conversion and lifecycle messaging from Clark Cummings, Senior Manager of Member Marketing, Marriott International. The session covered how Marriott had decided to insert relevant, value-rich content to a year-end email send. This came in the form of a “Year-in-Review” storyline that took members through their travels that year — it grew conversion rate by 9.7% year-over-year. The team kept that idea “in our back pocket for a while,” Abrahamson said, and we believed it would apply well to PRO Plus™ Loyalty customers, a loyalty group that exists solely online. On Jan. 5, the team created their own version of a “Year-in-Review” email that went out to this group. The email showed how many points they were awarded, how many they redeemed, and how many they donated. That send had a 49% open rate and a 34% effective rate, Abrahamson said. “Under each section, we had a call-to-action,” she said, adding that because they were reminding them of their points, it made sense to funnel them into redeeming those points. 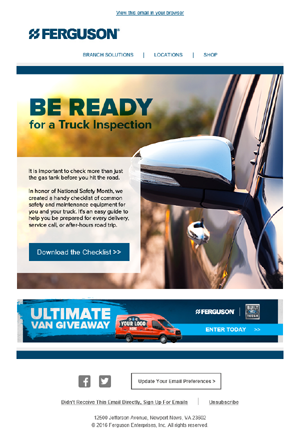 An evolution for future campaigns was inspired by a send during National Safety Month, where the team created a PDF checklist for customers to download on common safety and maintenance equipment for tradesman and their trucks. Ideally going forward, she added, the team would want to develop content like that to exist on the website. “In the future, we really don't want to dead end [customers] and just have them download a checklist. We want to take them to a page with the checklist, and maybe more information, and have next steps as far as a call-to-action,” she said. Moving forward, Abrahamson said she would like to focus on creating email content that is both extremely valuable and also evergreen. As noted above, holiday-centric email content like the “PRO Plus™ Year in Review” campaign performed well with Ferguson customers. “We saw a 49% open rate and a 34% effective rate for this campaign, a great start to the 2017 holiday campaign season — which is every season, for Ferguson. While not all holiday emails perform quite this well, it is certainly a benchmark to shoot for in all future holiday sends,” she said. For the future, her team can focus on expanding the holiday or event-themed emails with business segments that haven’t fully embraced it yet. This expansion could include weather-preparedness, a problematic and useful topic for many of Ferguson’s customers. “It’s a hot topic, but these are very timely, quick turnaround-type templates or content, so it involves working with web content to make sure that we have content up on the site about weather preparedness, whether it be about winter weather prep, hurricanes or similar weather-related issues,” Abrahamson said. In that situation, an email would follow suit that had a cohesive look and branding, with links to relevant products to help customers prepare. Her team has created a few templates so far, she said, but it’s important to focus on how to proactively help a customer solve a problem, without coming across as capitalizing on that problem. “We’re trying to think of out-of-the-box ways to expand our email content beyond product-specific promotions. We’re trying to expand our wheelhouse,” she said.